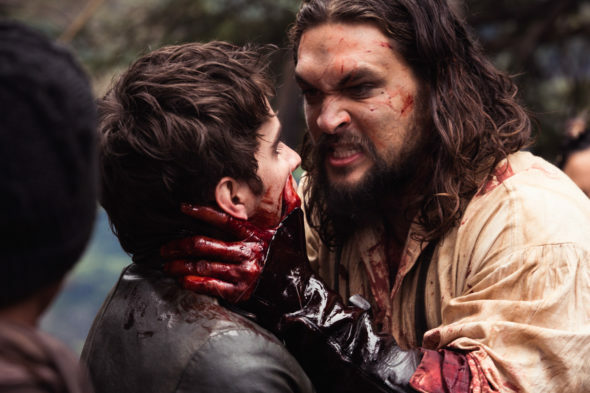 Frontier: Season Four; Jason Momoa Says Netflix Series Is Renewed – and Ending? Is Frontier ending? Recently, star Jason Momoa revealed the Discovery Canada TV show will return for a fourth (and possibly final?) season. The historical drama, which airs on Netflix in the U.S., centers on the rough and often violent North American fur trade of the late 18th century. In addition to Momoa, the series stars Alun Armstrong, Zoe Boyle, and Landon Liboiron. On Instagram, Momoa revealed Frontier will return for a fourth season. Later, Momoa posted a message saying “Rest in Peace Declan,” suggesting season four may be the last for the Discovery Canada series. Neither Discovery Canada nor Netflix have confirmed the news. What do you think? Have you seen Frontier? How do you want the series to end? More about: Discovery Canada TV shows: canceled or renewed?, Frontier, Frontier: canceled or renewed?, Netflix TV shows: canceled or renewed? Shallow story line, repetitive theme (capture, torture or ?, escape repeat, repeat, repeat), poor acting. Cancellation would be merciful. Longmire and Godless much much better in everyway. Please do not cancel. Love the show. Please make a good decision and continue. Don’t you dare take my Frontier off!!!! My husband and I both love the show. Please do not cancel. Its like waiting for Game of Thrones! NO NO NO! I absolutely love this show! I worried about this with aquaman and all. be very sorry to see it end. He is one of the best leading men in film. I do not want to see Frontier end. It is a great series but if it has to end do not leave anything dangling.